The Microsoft Surface Pro 6 is a 12-inch Windows tablet that starts at 899 US Dollars. Yes, it is quite expensive but offers a lot of premium features. Those include a high-end magnesium body, a high-resolution screen, up-to-date hardware and accessories like a keyboard cover and stylus. Here is everything you need to know about the Microsoft Surface Pro 6. The design of the Microsoft Surface Pro 6 did not change at all compared to its predecessor. As usual, it features a magnesium-alloy body that feels very high-end and is just 8.5mm thin. In addition to grey, you can also get it in black now. And on the back, we still get the excellent kickstand. While the tablet does not have a USB C port, it does offer a full-size USB 3.0 port. Additionally, we get a DisplayPort, a standard headphone jack, and the Surface Connector. That one is a magnetic port that is used to charge the tablet. Underneath the kickstand sits a microSD card slot. The cameras have a resolution of 5 and 8 megapixels. We also get an IR camera on the front for Windows Hello facial recognition. The Surface Pro 6 has a 12.3-inch PixelSense screen with an aspect ratio of 3:2 and a resolution of 2736 x 1824 pixels. Underneath the screen, we get Intel Core i5 or Intel Core i7 quad-core chipsets, depending on the version. Other options include 8GB or 16GB of RAM and a 128GB, 256GB, 512GB or 1TB SSD. Consumers usually get the tablet with Windows 10 Home. However, enterprise customers mostly get it with Windows 10 Pro. Even though the Type Cover and Surface Pen accessories are optional, you probably want to get them anyways. 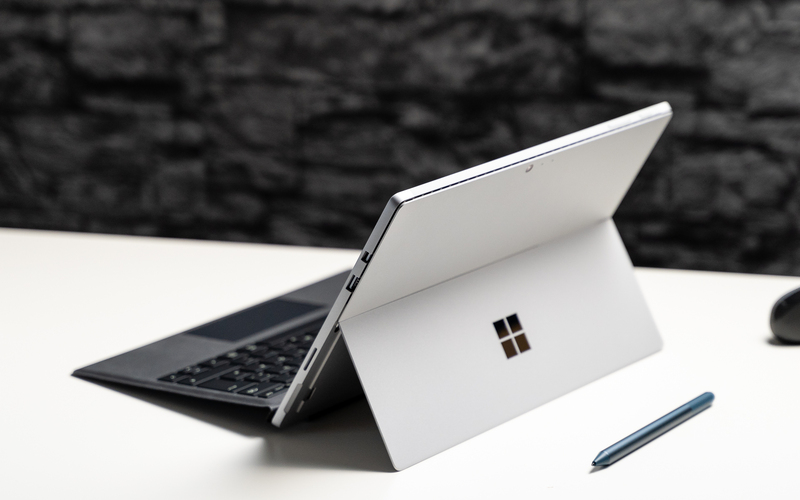 The Type Cover is a keyboard cover that connects magnetically to the Surface Pro 6. With that, you convert the tablet into a notebook. Compared to most competitors, the keyboard is outstanding. Another option is the Surface Pen which is an active stylus. The pen supports 4096 levels of pressure sensitivity. You can use it for handwritten notes, to draw something, or to use it in apps like Photoshop. Microsoft started to sell the Surface Pro 6 in October of 2018. In the US, prices start at 899 US Dollars, not including accessories. While prices in Asia are similar, you have to pay at least 1049 Euros in Europe. The tablet is available almost worldwide. There are two very interesting alternatives to the Microsoft Surface Pro 6. One direct competitor is the Lenovo MIIX 520. While it offers very similar internal hardware, the screen and build quality are not as good. However, usually, it is much cheaper. If you want the same Surface experience without spending that much, you could check out the Microsoft Surface Go. Yes, it is smaller, cheaper, and not as powerful. But it features the same design, an excellent Type Cover and even the same Surface Pen. Even though the Microsoft Surface Pro 6 is very pricey, it is an excellent Windows tablet. In fact, it offers an outstanding design, a great display, and a good performance. Additionally, the battery life, Type Cover, and Surface Pen are excellent too. Among its few downsides are the price and a missing USB C port.